Classic, creamy coleslaw is a perennial picnic and cookout favorite. Like potato salad and baked beans, coleslaw plays a popular supporting role on any plate starring fried chicken or barbecued ribs. While I adore a thick slaw with a hearty dose of mayonnaise, many people prefer a lighter vinegar base. Smoky cumin, tangy lime and sweet honey may be somewhat unexpected in a coleslaw recipe, but they can work together to create a bright-tasting vinaigrette with broad appeal. The following dish is a variation of my friend Lisa’s recipe that is mayo-free but full of flavor. The familiar flavor profile may even woo those who typically pass over a more traditional version. 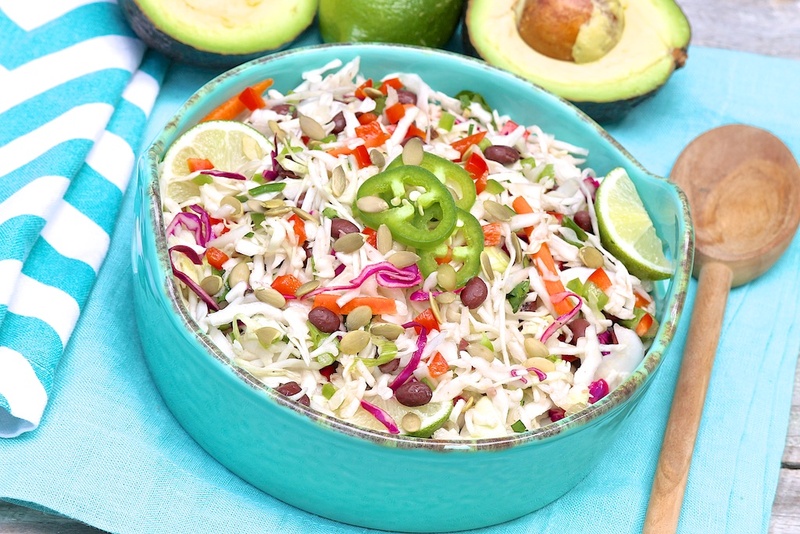 As a kid, coleslaw was not my go-to item on the barbecue buffet, but this southwestern spin has earned a stamp of approval from my two kids. A few well-chosen add-ins complement the south-of-the-border vinaigrette while providing a little extra staying power. For those who view coleslaw as more of a condiment than a side dish, this version falls squarely into the salad category. The addition of protein-rich black beans also makes this colorful salad a worthy vegetarian option. For an even heartier main dish, use the crisp slaw as a bed for grilled shrimp or chicken. The flavors in this slaw improve over time, making it a convenient prep-ahead option for quick family dinners and weekend potlucks alike. To round out the theme, pair with almost any protein (flank steak, chicken, shrimp or pork) that has been marinated in a mixture incorporating ingredients like cilantro, chili powder, lime and/or tequila. Recipes including seasonings typical of tacos, fajitas and enchiladas—even curries—are sure to make a welcome match. By nature, a good coleslaw recipe is versatile and will take you as far as your imagination allows. Fish tacos are an ideal destination for this cumin and lime-spiked slaw. A leftover bowlful will stand alone as a light yet satisfying lunch, and the tangy crunch will liven up a basic turkey sandwich. To test just how long this coleslaw would last, I recently held a small bowl in the fridge for a full week –and it still tasted incredibly good. In a small bowl or jar, whisk together the lime juice, honey, vinegar, oil, cumin, salt and pepper. The dressing may be made up to several days in advance and refrigerated. Stir or shake well before using. In a large bowl, combine the coleslaw mix, black beans, red pepper, green onions, cilantro, and jalapeño pepper. Pour the dressing over the cabbage mixture and toss gently to combine. If time allows, refrigerate the coleslaw for an hour or more before serving to allow the flavors to develop and permeate the cabbage. Just before serving, stir in or top with the pepitas or sunflower seeds and chopped avocado. If you expect leftovers, I recommend adding the avocado as a topping rather than stirring it into the salad, as it will not stay as fresh once chopped. Likewise, the seeds will better maintain their crunch when sprinkled over top just prior to serving. Diced fresh tomato or halved grape tomatoes offer a fine option to the red pepper, although they tend not to hold up quite as well when refrigerated over time. The jalapeño pepper may be omitted, although once the seeds are removed, it will add little in the way of heat. If you do prefer some spiciness, include some of the seeds. Recipe adapted from Lisa’s Dinnertime Dish. This is the one of the only coleslaw recipes I can get my family to eat and they love it! Thanks for sharing with your readers! I like your addition of red pepper and I also love your suggestion to top it with grilled shrimp! Have a great weekend! Thank you, Lisa. Everyone in my family loves this salad and I’m always thrilled to have the leftovers for lunch! I cannot wait to try this! I have begun eating raw and sometimes it is difficult to find recipes that are different, raw, and aren’t a variation of a typical salad! I hope you enjoy this as much as we do, Julie!